GRAND RAPIDS—In some of the poorest neighborhoods in Grand Rapids, in places inured to academic failure, children are grasping at a chance to defy the odds. So it was one recent spring day, in a pre-K classroom on the city’s southwest side. In a poor, largely Hispanic neighborhood, where more than half of adults over age 25 lack a high school degree, a group 4-year-olds watched a classmate draw a “2” and a squiggly “O” on a whiteboard. Given the area’s demographics, it’s a promising glimmer of early learning. And one that’s being repeated in 34 classrooms scattered around the city, in a pre-K network that brings uncommon resources to bear for some 400 children and their families. Classes are small. Teachers are well trained. Family coaches, often bilingual, help parents with everything from applying for cash assistance to figuring out how to get a car fixed to setting vocational goals. Just as important, teachers, coaches and administrators encourage parents at every step to share in their child’s learning. 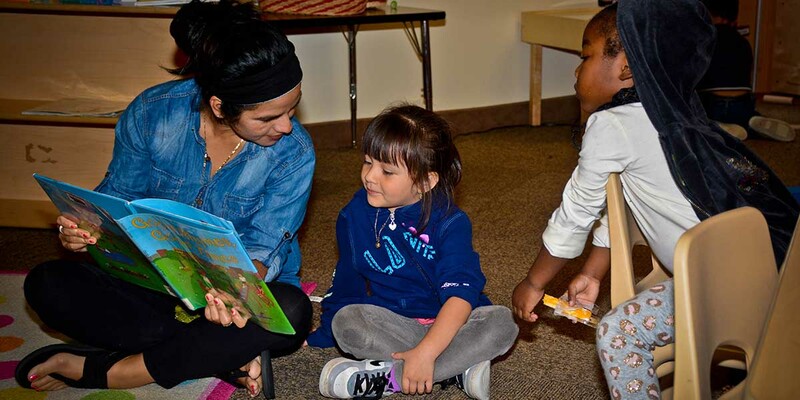 The Early Learning Neighborhood Collaborative (ELNC), launched in 2011, it is now enrolling some children before they can walk, in a venture made possible by millions of dollars in foundation funding. Can early learning programs like this be expanded to help low-income students across Michigan? Are state taxpayers willing to help fund universal preschool, knowing they won’t see financial benefits for many years? As recently as 2016-17, an assessment of 4-year-olds in the Grand Rapids program still found fewer than half met age expectations for learning and readiness when the preschool year began that fall. By spring, however, 90 percent or more met expectations. The program’s three-year-olds posted similar gains. Experts on Gov. Rick Snyder’s Michigan’s 21st Century Education Commission last year recommended universal preschool statewide as as critical part of reversing Michigan’s educational decline. But that hasn’t happened, by and large, because it would cost $400 million more per year. Can the results emerging from Grand Rapids help change the tide in Lansing? The Grand Rapids program is built around partnerships with several community nonprofit organizations, and learning strategies educators already know work. But it was the Battle Creek-based W. K. Kellogg Foundation that laid the crucial foundation: giving $5 million in 2012 and $5.5 million in 2016. With a $1.95 million federal grant in 2017, ELNC this year added 12 classes for children under age 3, some as young as 3 months old. It’s extraordinary spending for such a targeted program. But without the Kellogg investment, especially, ELNC would not exist at this level. ELNC’s 4-year-old classrooms are funded through the state Great Start Readiness Program, a state-funded network of high-quality pre-K classes. Michigan added more than 21,000 kids and $130 million to its Great Start program after a 2012 Bridge Magazine investigation revealed that 30,000 eligible 4-year-olds weren’t enrolled because of lack of funding. But Great Start is limited to 4-year-olds, a limitation ELNC seeks to break through by creating classes for 3-year-olds and younger. John Austin, former president of the Michigan Board of Education, applauds the state for expanding access to Great Start. But the state acknowledges there are still roughly 30,000 4-year-olds from low- and moderate-income families without access to quality early education. “There’s still a gap,” Austin said, noting other states, such as Oklahoma, where all 4-year-olds have free access to quality pre-K education, have invested more heavily in early learning. Studies show high-quality early learning programs can help close the learning gap low-income children typically bring to kindergarten. That includes a 2016 study that tracked Kansas children from disadvantaged homes and compared those with access to high-quality early education to those who did not. By fourth grade, the study found, the students with quality early education “scored significantly higher” on math and reading tests. They were also more likely to attend school, and faced fewer discipline referrals. A more famous 2005 study found significant long-term benefits. It tracked more than a hundred students from low-income families in Ypsilanti and compared those who were enrolled in the 1960s in a quality preschool program with those with no preschool. By age 40, those who had been in preschool had higher incomes, were more likely to be high school graduates, own homes and have longer marriages. Ezeh, the ELNC founder, is optimistic students in the program will see improved outcomes as they progress through school and beyond. “I really do have high expectations,” Ezeh said, noting that without early intervention children from poor neighborhoods are far more likely to fail in school. Students from households in the bottom fifth for income are more than four times more likely to dropout of high school than those from families in the top 20 percent. High school dropouts earn one-third less than high school graduates, about a third of what college graduates make and, according to one study, are 63 times more likely to be incarcerated than students who finish college. Learning gaps between poor and more affluent children show up in toddlers as young as 18 months old. A 2013 Stanford University study of California children found that 18-month-old children from wealthier homes could readily identify pictures such as “dog” or “ball” much faster than children from low-income households. Six months later, at age 2, children from wealthier homes had learned 30 percent more words than children from poor families. Researchers say parents in wealthier homes are more likely to engage toddlers verbally and read to them more frequently. That makes early learning programs even more critical for the most vulnerable children. In 2010, Kellogg foundation officials approached Ezeh, director of the Early Childhood Education Program at Aquinas College in Grand Rapids, to research the educational needs of children in core areas of Grand Rapids. Ezeh found a majority of the 5,000 children in those neighborhoods had no access to quality pre-school. It confirmed what former Grand Rapids Superintendent Taylor said: Most were losing the race by kindergarten. The program is deliberately neighborhood focused, Ezeh said, and its classrooms reflect the culture of each neighborhood to make families and children feel welcome. In the school based in the predominantly Hispanic neighborhood, a play area includes small tortilla presses. A tablecloth features a print from Guatemala and pictures on the wall reflect Latin American countries that mirror the heritage of many students. At an ELNC school on the southeast side, with a mix of African American and white households, family coach Denise Solomon sat down in a meeting room to explain her role. Like other coaches, Solomon meets with the parents at the start of school to document their needs, and to begin building a relationship. She has dealt with parents who are suddenly homeless, without a job, depressed, or in some cases struggling to walk their child to school in the depths of winter. Research backs her up, as “toxic stresses” like domestic violence or drugs in the home interferes with learning and can have damaging effects. Another study concludes that “household chaos” is linked to greater likelihood of child misconduct. This past winter, Solomon worked with a young mother with a 3-year-old in the program who can’t drive because of a seizure disorder. She walked him to school from more than a mile away, but began missing days when it snowed or rained. In 2017, Nomsa Deng, 31, a mother of two, found herself depressed and with lingering pelvic pain following childbirth. She was in a divorce and struggling to afford clothing for her children. Her 4-year-old daughter, Zoey, is now in Solomon’s program. Deng said there were days she could not drag herself out of the house to get Zoey to school. Solomon reached out. “She found another parent close by to bring her to school,” Deng said. At the ELNC school on the city’s southwest side, acting administrator Kim Spencer said the program’s relationship with parents is critical. Tricia Jackson is in her fourth year as a “lead” teacher in the 4-year-old program, which, like that for 3-year-olds, has two teachers for every class of 16 students. Lead teachers must have a bachelor’s in early childhood education. Jackson has a master’s degree. Perhaps more than academic progress, Jackson gauges readiness by a student’s social development. She sees students who begin the year shy and withdrawn but leave with the maturity to verbalize concepts, to solve differences with classmates with words instead of conflict, to concentrate and listen. “Most could not write their names at the beginning of the year. They are writing their names now,” Jackson said. The Republican state legislature doesn't see any need to spend more money on "those people." Evidence and facts in the face of ideology won't work as this state can't race to the bottom fast enough. Not sure what the point about Lansing noticing is. If this is the great program claimed, why wait can't local communities raise their taxes and set it up? Is there some kind of magical power that funds raised on a state level have that funds raised on the local level lack or do state funds just appear out of thin air ? Or maybe just that some people can't stand the potential outcome of local democracy? The law limits local communities from raising funds. You can replace buildings but you CANNOT fund programs. The state runs the curriculum now. Secondly local communities with the greatest need often are the poorest. Raising anything is a struggle. Too bad our state has such a regressive tax structure that taxes the rich 20 percent at 5.6 PERCENT while the rest of us pay 9.2 to 9.8 according to ECONOMIC TAX POLICY CENTER REPORTS. Guess we know who counts in Lansing. Lansing controls almost all of the money for local schools. The state already controls a lot of preschool funding through their Great Start Readiness Program and could easily expand it. This program is funded by the state and administered by your county ISD. If a local school district wants to go to their taxpayers for more school funding they are very limited in what they can ask for. Your local school district lost nearly all of its ability to raise additional revenues in 1994 with the passage of Proposal A. Communities could treat this as a non-school entity. It is called PRE - SCHOOL after all. Communities fund all sorts of other social programs such as veterans, parks, seniors, homeless/animal shelters, recycle/waste services, what stops a community from offering Child Care, if they want? I don't see the state stepping in to stop them. Again I suspect too many interest groups only want stuff if someone else pays for it. THE Michigan lottery was "created " 1970 to Fund All Michigan Schools. show us the Money collected each week/months ..
donot call the Children LOW-Income they have no Jobs or Money.raise them to tiger standard! Low-Income persons/seniors gave and have more Jobs that are supported by them.medicare .dodtors.lwayers .hospitals drugstore and gustation are "supported" from low-income senior and families...stop it and give Seniors there $ 1,5 Trilloin SS lockbox money dUE in 2018 NOW in there monthly SS check of$ 5000 and see how fast there will be JOBS in each Cityand Village all over Michigan and all 50 States.donot Hold back! The lottery money does go to education. But under what people often call creative accounting, an equal amount is deducted from the education budget and moved to the general fund budget. Clever, eh? Schools in russia have 20X20 tv screens in classrooms and children have computers.so "when?\"? will michigan come into the 21 century? Always are ONLY mothers ,mentioned " in news /stories. Where are the fathers?only 205 of Mothers get there childsupportchecks/ WHY ? losing the "RACE" in kindergarten But getting there GED in jail ! At what cost to "lansing"?